PiNBank® is a new Point of Sale Activation (POSA) solution. This unique system has modernized and simplified the sales of all prepaid long distance and wireless calling cards, as well as many other prepaid products including prepaid music, gift cards, games and credit cards. PiNBank® uses one-of-a-kind countertop (POSA) terminals and barcode scanning systems to activate and sell all prepaid products. Get a FREE PiNBank® terminal and barcode scanner for your store. Buy PiNBank® long distance credits from your Territory Manager. Denominations of $250, $500 & $1000 are available. Add long distance credit to your PiNBank® terminal. You are now ready to begin activating phone cards and printing long distance vouchers. (Activating Phone Cards: Locate the barcode on the back of the phone card to be purchased. Simply hold the barcode in front of the scanner until you hear a beeping sound. Activation is now complete, and you may give the phone card to your customer). 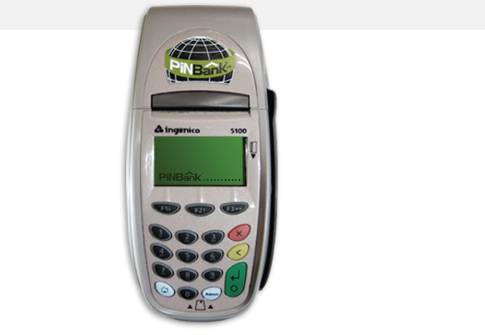 Get a FREE PiNBank® terminal for your store. Buy PiNBank® wireless credits from your Territory Manager. Denominations of $250, $500 & $1000 are available. Add wireless credit to your PiNBank® terminal. You are now ready to sell prepaid wireless airtime vouchers to your customers! From your terminal, press “Sell” then press ‘’Mobility’’ and select the carrier and the amount to be sold. Wait for your terminal to print the voucher. NO fees or start-up costs. FREE PiNBank® signs for your store. ALL prepaid long distance products available through LD vouchers. DEAL directly with your Territory Manager. INSTANT AND REMOTE terminal recharge through your Territory Manager. Bigger discounts than alternative products on the market. Free Point-of-Purchase material and one-on-one training for PiNBank® retailers. Never run out of inventory for wireless or long distance products. Minimal credit balance of $250 for each of your wireless and long distance accounts. Increased sales and walk-in traffic as a result of a wide product selection. Easy, fast and convenient system. Minimal combined monthly sales requirements (wireless & long distance).